Every marketer and founder has a secret weapon in their tool belt. We had two: Hotjar and Fullstory. We installed both tools (for free!) on both the website and in-app. We used Hotjar for heatmapping, on-site polling, and surveys, and Fullstory for in-app recording. This is how we were able to differentiate between users who were extremely engaged those who weren’t—and who were therefore likely to churn. As we were conducting interviews (which admittedly took a few weeks to get scheduled), I literally popped a bag of popcorn and watched hours of Fullstory sessions. Based on our data, there was a stark difference between "active" and "inactive" users. Rindle is the kind of platform that you would log into every day, multiple times a day—much like your email inbox or Slack. So if someone signed up and had less than, say, 10 sessions, then they weren't engaged at all. Compare that to the people with 200+ sessions, and you've got someone who's extremely engaged. For Rindle, the purgatory zone was right in the 20 session range. Users could either drop off entirely, or become paying customers. I was specifically looking for the behaviors or leading indicators of one outcome or the other. I was looking for those aha moments. What was the difference between people who move on to become paying customers and people who kind of drop off and cancel? I defined two segments inside of Fullstory: one where the user had < 20 sessions, and another where the user had > 20 sessions. For those with less than 20 sessions, I navigated to their first week with the platform (which, if you think about it, isn't hard when there's so little data on them). I then watched dozens of sessions in this segment—making notes on the interesting engagements, activities, and even bugs the user encountered in the platform. Next, I watched the highly engaged users, navigated to their first weeks (which meant sifting through dozens of recordings), and continued watching and note-taking. Based on my findings and notes, the differences between people who became customers and people who churned were astounding, and it all came down to five specific behaviors. Inside of that board, create their own lists or "workflow"
Based on the feedback from the interviews we conducted, the Dashboard was a critical piece to our users’ everyday workflow. If a user completes 4 out of 5 of these things, then they were still at risk for future churn. And if a user doesn't do at least 2 of them, then they were definitely going to cancel. So that made us wonder: If these are the most important behaviors for a new free trial sign-up to become a paying customer, then what's our onboarding like right now? I love a good teardown, and I knew we were definitely due for one. The best kinds of onboarding teardowns take a look at the user onboarding journey screen-by-screen, from signup all the way through to the user’s first first steps in the platform. It’s also important to describe what’s happening throughout the process. You don't need anything super complicated for this. Use a tool like Skitch to make screen capture and highlighting super simple, and pop everything into a Google Presentation. Your user onboarding teardown should involve a look at the user journey, screen-by-screen, from signup through the user's first steps. Some of the introduction videos were buggy and giving some users problems, creating a less-than-ideal experience. Inviting other users is part of the onboarding flow, but literally never appears again unless the user manually searches for it. In addition making notes about the in-app experience, you'll also want to understand what's happening in your user’s inbox. For email teardowns, I highly recommend using a template that can capture all of the emails a user receives during their entire engagement within the platform. You'll also want to create a column for suggested edits to make. 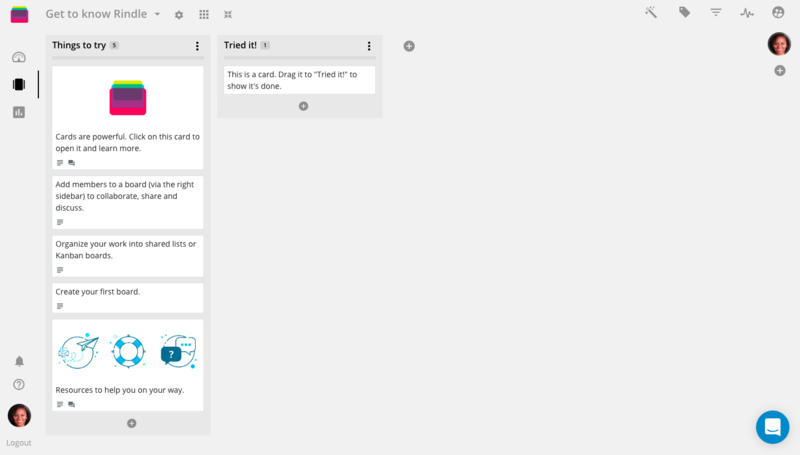 This is what I used when starting the onboarding teardown. Using a template for your email teardown will save you time and help you stay organized. 1. We were spreading the emails way too far apart. Every 4 days, the new user would get an email. Now, according to Val Geisler, email onboarding expert, that's probably way too slow. It's a long time to not hear from someone. I might forget about you in 4 days or forget that I even signed up. And as Val would say, imagine inviting someone into your house and not speaking to them for four days. That's kind of awkward. Plus, the trial is only 21 days, so they might not even complete the onboarding until after they've either cancelled or confirmed their payment. It might sound aggressive, but because Rindle is a high-touch platform, we'd probably need to send an onboarding email every day for the first week. 2. The juicy bits were sent too late. Due to the 4-day spread between every email, a user might not even read about or see Rindle's best features before they abandoned the platform. On top of that, the order of the emails themselves didn't correspond to the the behaviors that free trial sign-ups needed to get the most out of the product. We would definitely need to reorganize these and spruce them up a little bit. 3. We didn’t say a thing about customer support. 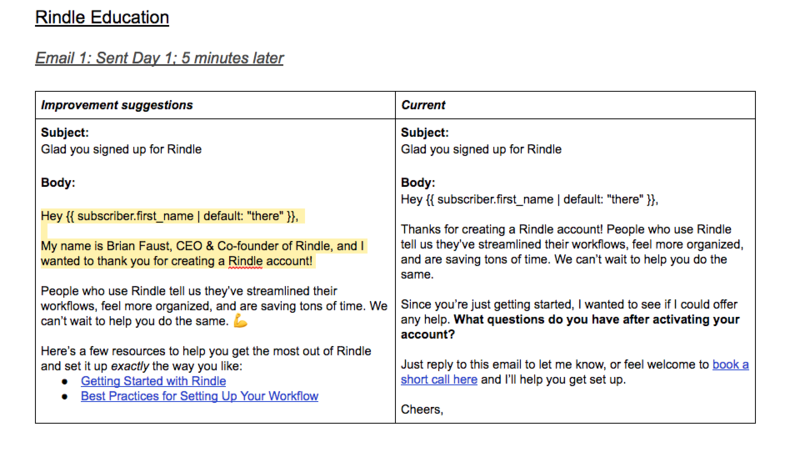 One of the reasons why people love Rindle is because of their crazy awesome customer support. If you have an idea for a feature, there's a really good chance they'll implement it for you. And if you encounter a bug or an issue, fixes happen quickly. Customer support is run by Tom —and you'll definitely become friends with Tom as you use the platform. But guess what? We don't say a thing about any of that in our customer emails. It's like inviting someone to your house and then never introducing them to the people who live there. 4. We didn’t prepare the customer for product announcements. Getting the new user onboarded and familiar with their surroundings is priority number one. But what about setting the stage for future communications? What if we release an *amazing* new feature and we want to make sure they know about it? Shouldn't we give them a heads up about it first? The answer is yes, and we weren't doing any of that. We found that between the in-app experience, the email onboarding, and the desired behaviors of a paying customer, we definitely had some misalignment. But like any startup or SaaS journey, as long as you have a plan and the right expectations, you can execute quickly. Since we've updated our onboarding emails and knowledge base, and removed the more disjointed parts of the experience, Rindle has seen their free trial conversion rate go from 13% to 40% in just a few short months. This seems like a no-brainer, but certain audiences are more likely to churn out of the free trial than others. If you focus on the audiences that are likely to get to the "aha" moment as fast as possible, your free trial conversion rate will naturally go up. Quickly growing, nimble teams make the most sense for Rindle. So growing agencies with tons of contractors and freelancers or startups that are scaling quickly typically get the most value. We turned our attention towards these two audiences and have been tracking their progress along the way. People seem to have gotten so used to mediocre, automated customer support that they were genuinely surprised by Rindle’s responsiveness. Despite some of the in-app and email onboarding challenges they faced, people reacted to the support experience positively. That’s because Rindle has amazingly responsive and quick customer support. And to be honest, we didn't realize at the time just how crucial this was for us. It's tough to prove, but we think this onboarding experience had a lot to do with the free trial conversion rate increasing. We're always making tweaks to the onboarding experience, and there are a few more things to try out. And because the feedback loop from customers is never-ending, we’re constantly taking notes on what makes a truly great onboarding experience and what could be improved. I hope this article has given you some ideas about how to discover your own aha moments, and how you can run your own onboarding teardown. Good luck!